Last week, at a public meeting, I was asked several times if this famed "peak oil" has arrived or not. People who have heard of peak oil seem to be becoming impatient, but I am afraid we'll have to wait a little longer. Peak oil is not here yet, at least if we intend it as a significant decline in the production of combustible liquids. Does that mean that the predictions based on the Hubbert model were wrong? In a sense, yes: you should know that all models are wrong by definition. Some, however, can be useful if you know how to use them. That's the case of the Hubbert model: it had given us a useful warning that, however, we chose to ignore. Let me explain this point by means of a summary of a talk that I gave at the conference on the future of energy organized in Basel by the Club of Rome on 16-17 october 2011. A few months have passed since I gave that talk, but things haven't changed much from then. Good afternoon, ladies and gentlemen. My time today is short, so I'll try to go as fast as possible, limiting myself to a brief discussion on the models that lead to the concept called "peak oil." From that you can make up your mind yourselves on what's happening today to the oil market and how the economy could be affected. You see that the curve is supposed to have a peak midway, and that is the element that has gained most of the attention today. The date of the peak, in particular, has taken a certain value of prophecy. And there is no doubt that Hubbert got something right. Here is a comparison with the historical data. Now, as you can see, the agreement with the historical data of one of the curves proposed by Hubbert is very good. Actually, it is excellent considering the time span involved. It is not so easy to make a prediction that turns out to be so good 14 years afterward! And the prediction continued to be good for many years, until recently, when production showed an increase that moved it away from the Hubbert curve. But, again, that doesn't detract from the fact that Hubbert had clearly predicted that production would run into troubles at a certain point. It did. As you see, the curve for the world has the same shape as the one for the US states and the peak was supposed to occur around the year 2000. In later times, other authors revised Hubbert's study using similar methods. For instance, Campbell and Laherrere in 1998 saw the peak for around 2005. Later on, ASPO (Association for the study of Peak Oil) revised these predictions finding the peak somewhere between 2005 and 2010 (see, for instance, these 2007 predictions). How do these results compare with the actual historical data? Let's see some data by Euan Mearns, which include not just crude oil, but also condensate and natural gas liquids. The future is not an easy thing to study. It always fans out in multiple paths as you move onward. So, you use the models not in order to make predictions, but to understand what path you have taken. Without models, you are walking on, blindly, and you have no idea of where you are going. With models, it is like having a flashlight. You may not be able to see far away in the darkness, but at least you have some idea of what you are stepping on. Good models will give you a longer range, less good ones will be more limited. But if you know what your model can do (and what it can't do) then a model can always be useful. We can apply these considerations to peak oil models. The simplest version, as we said, is Hubbert's one. We could call it a "first order" model as it assumed that the main factors affecting oil extraction are related to geology and that the industry would continue to act as usual, even when facing the peak. But that didn't happen. The market reacted with increasing oil prices and the production system adapted by pouring investments into the exploitation of expensive oil resources that the Hubbert model didn't consider as extractable. In a sense, the future was changed by a "second order" factor: prices. And so we took a different path; we didn't have a peak; not yet, at least. But the Hubbert model had not been "wrong;" it had done well within its limits. It had given us a useful warning that we should have expected troubles with oil production during the first decade of the 20th century. We chose to ignore that warning and we were taken by surprise by the price spike that is causing us a lot of troubles. The future always surprises you, especially if you don't have good models. Seneca, as you may remember, was a Roman philosopher who had noted that "ruin is much faster than progress". The Seneca model is a "second order" model in the sense that it takes into account factors that the simpler Hubbert model doesn't consider. You see that, in this model, the peak is smoothed out; it appears as a plateau that lasts for a while, similar to what we have been seeing with oil production up to now. Then, we have a precipitous fall, something that I called the "Seneca Cliff". Is this the future? Possibly; but always remember that if a model is a flashlight, it doesn't show to you more than a dim impression of a number of different paths that the future may take. Don't take the Seneca model as a prediction. We cannot predict the future, we can only be prepared for it. 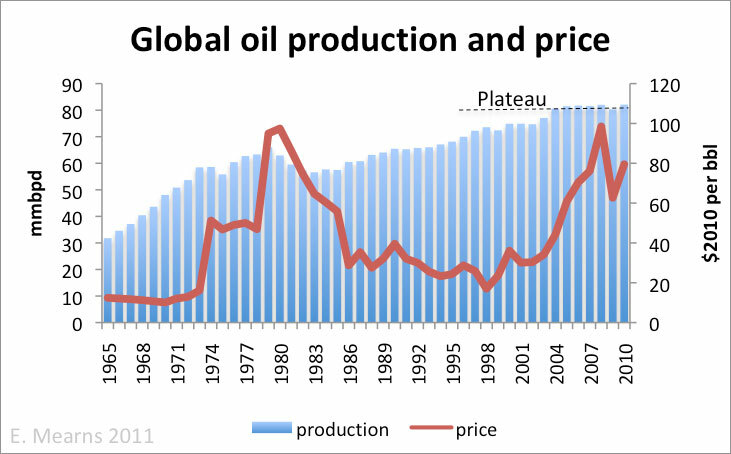 "No Peak Oil Yet? The limits of the Hubbert Model"
"Peak Eggs: Hubbert and the Easter Bunny"